One of my favorite things about working for Urban Yarns has to be getting to know the lovely and talented people who work there. 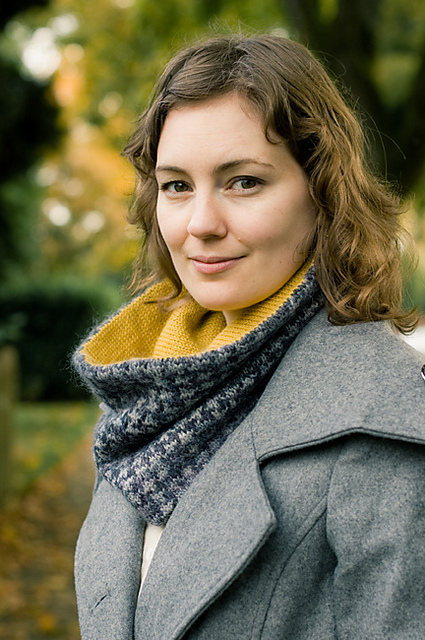 Ann is certainly no exception and I’m so happy to share her new knitwear design company Caribou Knits. Ann has been diligently working for some months now creating her company and working on her first designs. I cannot wait to cast on for a Brae Cowl of my very own. Elegant houndstooth combined with the practicality of a cowl, and a fantastic colour combo too! 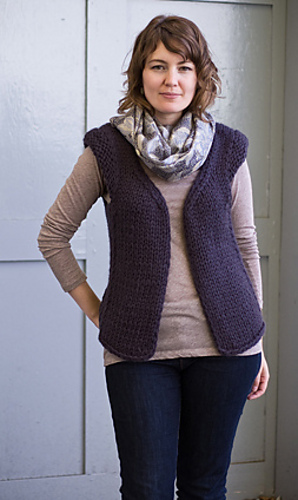 There are also 2 comfy looking vests from Caribou Knits, Samara and Kettle Valley. Both stylish and effortless looking, they remind me (unsurprisingly) of Ann. She always looks like she just threw something on and it looks fabulous. Samara is knit in Rowan Big Wool and Kettle Valley is done in Berocco Blackstone Tweed. I’m particularly pleased to see that all of Ann’s patterns come in a wide range of sizes, come one come all! This entry was posted on Thursday, October 27th, 2011 at 9:33 pm	and is filed under Uncategorized. You can follow any responses to this entry through the RSS 2.0 feed. Both comments and pings are currently closed.